Most referendum research is inspired by sociological institutionalist theory and traces the use of referendums back to an alleged crisis of representative democracy. The aim of referendum research is usually not to explain why referendums are designed in different ways in different countries, nor why political actors in some countries are more likely to use them. 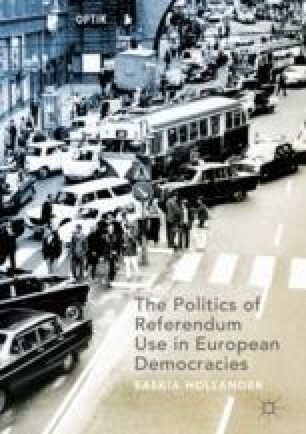 To provide a better understanding of referendum practices, and how that varies among countries, this chapter provides an analytical framework that combines sociological institutionalism with insights from classical institutionalism, which places strong emphasis on a country’s existing institutional context, historical institutionalism, which examines the role of path dependency in choices to institutionalize and use referendums, and rational choice institutionalism, which explains referendums in terms of political actors’ strategic interests. Börzel, T., and T. Risse. 2000. When Europe Hits Home: Europeanization and Domestic Change. European Integration Online Papers 4 (15). http://eiop.or.at/eiop/pdf/2000-015.pdf. Accessed 15 Feb 2013. Fiorino, N., and R. Ricciuti. 2007. Determinants of Direct Democracy. CESifo Working Paper No. 2035. https://ideas.repec.org/p/ces/ceswps/_2035.html. Accessed 18 June 2015. Häusermann, S., and H. Schwander. 2009. Identifying Outsiders Across Countries: Similarities and Differences in the Patterns of Dualisation. REC-WP Working Papers on the Reconciliation of Work and Welfare in Europe No. 09-2009. Edinburgh: RECWOWE Publication, Dissemination and Dialogue Centre. http://papers.ssrn.com/sol3/papers.cfm?abstract_id=1489943. Accessed 5 June 2014. Hooghe, L., and G. Marks. 2004. European Integration and Democratic Competition. Paper Prepared for the virtual Europolity Conference of the Friedrich Ebert Stiftung. http://www.fes.de/europolity/finalversionhooghText.PDF. Accessed 15 Feb 2014. ———. 2008. Bringing Ideas and Discourse Back into the Explanation of Change in Varieties of Capitalism and Welfare States. Centre for Global Political Economy, Working Paper No. 2, 1–25, May 2008. https://www.sussex.ac.uk/webteam/gateway/file.php?name=cgpe-wp02-vivien-a-schmidt.pdf&site=359. Accessed 15 Feb 2013.